Georgia Southwestern honored five of its most distinguished alumni in the inaugural year of the Outstanding Alumni Awards Dinner. One graduate from each of the University's colleges/schools was recognized. For the first time, Georgia Southwestern State University (GSW) honored alumni from each college/school on campus. 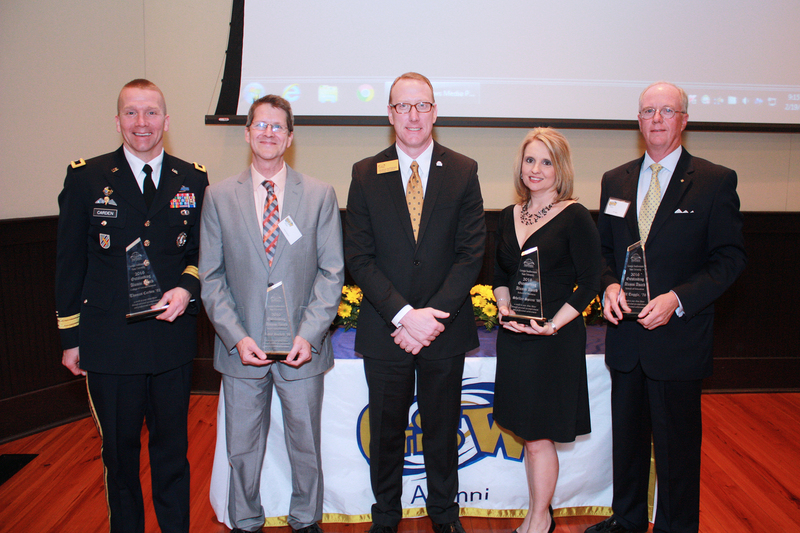 The event, which recognized five Outstanding Alumni Award recipients, took place Friday, Feb. 19 in the Assembly Hall of the Wheatley Administration Building. The Outstanding Alumni Award was developed to recognize the distinguished personal accomplishments and professional achievements of Georgia Southwestern Alumni. The event was attended by 150 alumni, faculty, staff and friends of GSW. Jimmy Melvin (’59) was the events featured speaker. Deans from each of the five colleges/schools gave the alumni introductions. The program also featured GSW Alumni Association President Lemond Hall (’98), GSW Foundation Executive Director Reda Rowell and GSW Interim President Charles Patterson. Shelley Spires is the CEO of Albany Area Primary Healthcare (AAPH), a position she earned in September 2015. Spires has been on staff with AAPH since 2001 serving in progressively responsible roles, most recently serving as Deputy Director. Spires’ background is in human resource management (HR). After graduating with a Bachelor of Business Administration in HR from GSW in 1998, Spires served as HR director at Dooly County Medical Center in Vienna. She holds a master’s degree in healthcare management from Troy State University. Spires has been named one of “Small Town America’s 100 Most Influential People,” and she was listed as one of Southwest Georgia’s “Top 40 under 40” by the Albany Herald. Having established himself in a 20-year career in electronics and broadcast engineering, Royce Hackett brought his skillset to Georgia Southwestern State University in 1997 as an instructional technology coordinator and to complete his bachelor’s degree in computer science. Hackett graduated in 2001 and earned a master’s degree in computer science in 2004. After being promoted to manager of instructional technology in 2002, Hackett was named GSW’s chief information officer (CIO) in 2007. Under Hackett’s leadership, GSW has created a foundation for the school to leverage technology to meet the 21st century needs of the faculty, staff and students. Hackett has established himself as a leader among his peers in the University System of Georgia (USG), having served as the chair of the USG Security Advisory group from 2011-2013. He currently serves as secretary of the USG CIO Advisory Council. Outstanding Alumni Award recipient Alf Tuggle held a successful 37-year career as a professional scout, retiring last year as the assistant chief scout executive and chief financial officer for the Boy Scouts of America (BSA). After joining the BSA in 1976 as a professional scout, Tuggle went on to serve as scout executive for the Chattahoochee Council in Columbus, Ga., the Heart of Virginia Council in Richmond and the Greater Pittsburgh Council in Pennsylvania. He was later promoted to director of the Southern Region in Atlanta in 2007 as a member of the national staff, prior to his final position in 2009. Tuggle was given the Virginia Governor’s Award for Volunteering Excellence in 1993. In 2011, he was given the World Scout Foundation’s Baden-Powell Fellowship Award, and he received the Bronze Pelican Award by the Catholic Church and the Torch Award by the United Methodist Church for service to youth. Brigadier Gen. Thomas Carden, Jr.
Brigadier Gen. Thomas Carden, Jr., was installed as commander of the Georgia Army National Guard in January 2015. He joined the Guard full time in 1996 after serving as a probation officer in Sumter County for four years. He enlisted with the Guard in 1986 as a senior in high school. In his 30 years with the Georgia Army National Guard, Carden has served as chief of staff, deputy chief of operations, commander of the 560th Battlefield Surveillance Brigade, and he led the Guard’s Recruiting and Retention Battalion. Some of Carden’s military decorations include the Legion of Merit, the Army Commendation Medal and the Army Achievement Medal. In addition to his bachelor’s degree in history from GSW, Carden holds a master’s in strategic studies from the U.S. Army War College in Carlisle, Pa. and a master’s in human resource management from Webster University in St. Louis, Mo. Since 2013, Patricia Starck has been the senior vice president for interprofessional collaboration at the University of Texas Health and Science Center at Houston (UT Health). Her career nursing education has been one of continuous progression. From 1984 to 2015, she served as the dean of nursing at UT Health. Prior to that, she served as professor and dean of nursing at Troy State University. Additionally, Starck has served on the nursing faculty at Georgia Southwestern, St. Petersburg Junior College in Florida and Albany State College. In 2015, Starck was given the President’s Award from the Viktor Frankel Institute of Logotherapy (VFI) in Dallas, Texas. She was inducted into the University of Texas Academy of Health Science Education in 2012, and she was given the VFI Lifetime Achievement Award in 2009. In 2003, Starck was featured as Georgia Southwestern’s Griffin Bell Distinguished Lecturer. Georgia Southwestern State University, located in Americus, Ga., is a public, four-year unit of the University System of Georgia with nearly 3,000 students. Georgia Southwestern offers professional programs of study and degrees in the arts, education, humanities, nursing, sciences, and graduate programs in business, computer science, education, English, and nursing. Founded in 1906, Georgia Southwestern is recognized as one of the best value small colleges in the nation. Visit http://www.gsw.edu for more information.